We specialize in the baking industry – Snack cakes, cookies, granola bars, fruit bars, bread, rolls, pizza, fried products, peanuts, chips, pretzels and pies. Established in 1983, Woods Fabrication, Inc. is a U.S. company specializing in meeting the needs of the baking industry. Systems extend from the simplest of individual conveyors to the most sophisticated of complete line handling systems. Our facility – approximately 45K sq. ft.
All jobs are kept on file for future reference and to order parts, etc. Our 4 full-time Drafting & Design Engineers will assist with layouts and engineering solutions as needed. 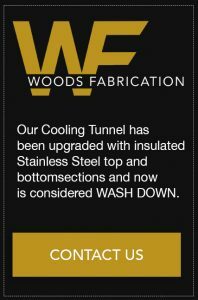 Not only does Woods Fabrication custom design conveyors and cooling tunnels, but we design and fabricate crossovers, catwalks, platforms, hoppers, product diverters, and other related bakery equipment. Our company is dedicated to our clients, and strives in customer satisfaction.